In honour of my upcoming trip to Georgia, here is my healthy twist on the Southern classic — Peach Cobbler. It was my all time favourite dessert growing up, and I am excited to say that making it vegan absolutely did not compromise on taste whatsoever. And adding the Rosemary is totally optional but really adds to the flavour. Fresh in season right now, peaches are just the bees knees. In addition to their many vitamins and minerals, and, of course, delicious flavour, peaches are full of disease-fighting caretenoid antioxidants. The crust is made from buckwheat flour, wholegrain oats, pumpkin, sunflower and hemp seeds, so there is a nice dose of complex carbohydrates and no refined sugar. If you’ve not used Buckwheat flour before then you are seriously missing out! It is a gluten-free, high fibre, high protein alternative to white flour that is also higher in many essential vitamins and minerals than white flour. This dessert is 355 calories and provides 8g of plant-based protein and almost a third of my daily fibre requirements. Best enjoyed with a spoonful of oat cream on top. Happy Weekend y’all! · Wash and dice the peaches. 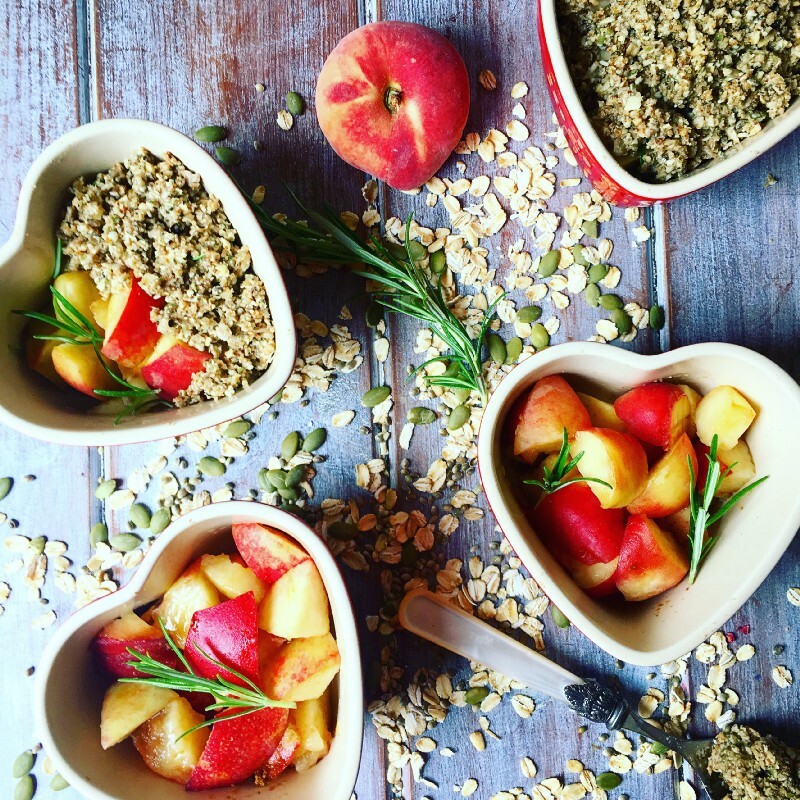 · Either distribute them evenly between 8 separate ramekins or spread out in one whole crumble dish. · Sprinkle with Rosemary the 1 tbsp sugar between the whole lot. · Add all of the ingredients apart from the sunflower, hemp and pumpkin seeds to a blender and mix well.